We in the northern hemisphere are waving goodbye to summer and although it is fairly warm over here in the UK at the moment, the nights are starting to draw in and you can feel a change in the temperature. At times like these, guinea pigs start to feel the cold as well sand are not quite as happy in the cold. So what can we do to keep them warm and in their optimum temperature? Here are some ways we can keep a guinea pig warm during these months ahead. Bring the guinea pig inside. Pretty obvious right? But not everyone does it. If you are cold outside then they will be too. They will be much happier in the temperature you are happier in. Purchase a snuggle safe disk which looks like a Frisbee and can be heated in a microwave in a few minutes and then gives heat to a guinea pig for up to 8 hours. Put a small blanket in their cage. I have also used old t shirts and other clothing to make caves for them. Anything like this can help keep them warm and snug. Put lots of shredded paper in the cage which they can crawl under and hold their body heat in. Held in a box of some kind that they can crawl into would be best. Get a shoe box and cut a hole large enough for the guinea pig to crawl through and put bedding inside. The enclosed space inside will help to conserve their own body heat. Purchase a pigloo which can do a similar job. Put a blanket over the cage during the night and then take half of it off during the day time. Purchase a cozie or a cuddle cup. They’re a big hit with guinea pigs as they love to snuggle up inside them. Move the cage away from windows and any drafts. These can make the guinea pig very uncomfortable. Make sure they have another guinea pig to snuggle up to. They are naturally very good at keeping each other warm. If you only have one guinea pig, consider getting another to keep it company. If you have two consider getting three, and so on. The more of them there are, the more they can snuggle up to each other and keep warm. Have a rice sock. This is an alternative to the heat pad which is basically taking an old sock and filling it with rice. Put it in the microwave for one minute. The rice will warm making it very comfortable for the guinea pig to snuggle up to. Hot water bottles offer a terrific source of heat during the night. Just put hot water on it, put a cover on it and ensure the lid is tightly shut. Test it out before hand to ensure that it isn’t too hot and maybe add some extra layers of blanket to protect the guinea pig. Make sure that it is covered all the way round it to ensure that the guinea pig doesn’t chew it. Block any drafts from doors and windows with blankets. Create tunnels for them to hide in. These can be purchased or made and guinea pigs love to run in tunnels and will even stay in them and sleep. If your cage is against a wall then put a blanket between the wall and the cage. The wall is keeping in the heat but will be naturally quite cold if they are right close to it. The extra layer of insulation will help conserve heat. Consider having a heater in the room to give the piggies warmth. Do keep in mind safety and that it doesn’t get too hot though. Make sure they are also kept well away from it as well. Keeping a guinea pig warm will ensure that they are happy and contented. You will notice the difference in their behaviour if you keep them in the temperature that they are happiest to be in which is 18-22 celcius/65-75 farenheit. There are probably some i’ve missed off. So sorry to hear that Nicki. I’m in the UK too, its cold here at the moment! I tried the Rice/sock thing, and it appears to work very well for my “stubborn” males who won’t get along–my other piggies have friends, so not as much worried about them. Thanks for the tip! It’s extremely cold in the US to (18 degrees Fahrenheit) and both my guinea pigs are sick. So to keep them warm I made them a box lined with fleece. I wish I could put them together but as they’re both sick that might not be the wisest choice. So thanks for the ideas. If anyone’s looking for fleece tunnels check out ebay! Guinea pigs love them! They are double fleece and very warm. I hope your piggies made it through the winter ok. Try to put as much insulation such as clothes and blankets in and around their living area for them. If you have hideys for them, put an extra fleece blanket under each. These have to be changed and laundered every few days or once a week, too. Newspaper, I’ve used an extra small doggie bed, lined it w newspaper, then put an old t shirt in it. Whatever works for u. Practice makes perfect. Great tips! We are indoors and have pigloos on our fleece liner. So we can hide from any chill/draught. Are these tips okay if you are keeping piggies in an outdoor wooden shed? 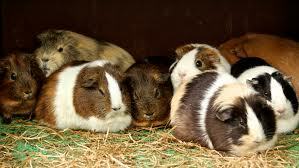 Thankyou so much for this website as it has helped my Guinea Pigs and now they are toasty and warm. But what do I do in the summer to keep them cool? I have an air conditioner on and my Guinea pig is away from it but I still feel like he might be cold but without it it’s way to hit any suggestions? Great suggestions! I have been looking at pigloos, cuddle cups etc…but don’t they get wet and dirty very quickly? Do you have to clean and dry them every day? My pigs don’t have a usual toilet area so whatever we use to line their home gets soaked. At the moment I just replace sawdust every day.